What does competition mean to you? Does it mean succeeding at all costs? Does it mean feeling bad about one’s self when one doesn’t win? Does it mean a constant comparison to other people? Does it mean strained relationships because you are trying to just be who you really are and other people are still caught up in competing with you because they do not yet believe in the value of themselves as they really are? 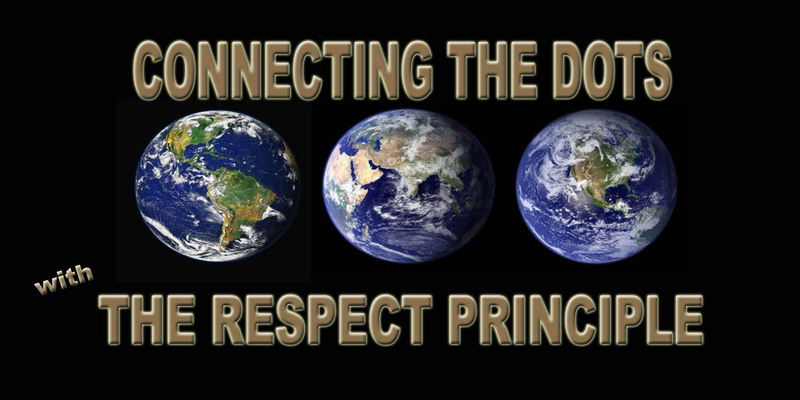 Based on the Connecting the Dots … with the RESPECT PRINCIPLE, our definition of competition and one’s success will be based on our internalized RESPECT LEVEL. Before proceeding, let’s keep in mind that most of what drives our unconscious or subconscious thoughts and actions is a deep, negative, global conditioning I call the Disrespect Philosophy … the core belief that no one is worthy or entitled to be valued … respected … without some qualifier … without someone’s or some stamp of approval by some group … and this is the root of unhealthy competition. Unhealthy competition is a drive that compels us to constantly compare ourselves to others. When people do not reflect us and our beliefs, we judge them to be above or below us. If above, we try to be something we are not … something that does not feel natural to us nor does it make us feel good about ourselves and since we will not measure up, we will seek ways, mostly in our minds, but some people act out their thoughts and feelings, to knock our “competitor” down to our own level … or below. If we judge someone as below us, we ignore them completely or treat them as less valuable or worse. People with a high RESPECT LEVEL know competition between ourselves and others does not really exist because the only person we can truly compete with is our self. We know we are unique individuals and our only real challenge is discovering, expressing and refining our unique qualities, gifts, talents … strengths. Sometimes that translates into our winning a prize or special recognition or being selected for a job, etc., but often mostly translates into how we choose to live our daily lives. With a high RESPECT LEVEL, competition is not seen as a drive to be better than another, but about being the best we can be, about doing the best we can … and letting the results not be viewed as failure, but just as an experience … an experience we can appreciate, learn from or let go of in order to move forward. There really are no losers or winners if we are all doing our best to be who we really are underneath all the external expectations. We were created as beautiful, unique beings, with our own unique gifts, talents and abilities to discover, develop and share. Do this one thing and we win every day of our lives … and so does the world we share with the rest of the beautiful, unique beings who need to be taught how not to be carbon copies of others, but to be who they really are too.